The biggest race in the world once again will be featured during the most-watched American television program of the year, as an advertisement for the 103rd Indianapolis 500 presented by Gainbridge will air during the CBS telecast of Super Bowl LIII on Sunday, Feb. 3. The 30-second spot, which is scheduled to be shown at the end of the second quarter on CBS affiliates in Indiana, promotes the “This Is May” campaign around the race. The ad features a fast-action mix of scenes from the Indianapolis Motor Speedway and greater Indianapolis, exciting Indianapolis 500 action with the drivers of the NTT IndyCar Series and a song and narration from country music star Clayton Anderson, an Indiana native who performed at the 2017 Firestone Legends Day Concert at IMS. Mortenson Kim + Raidious and IMS Productions collaborated to create the spot. This is the fourth consecutive year in which a “500” advertisement has aired during the Super Bowl telecast, which easily draws the largest American television audience of any annual program. Super Bowl LII drew 103.4 million viewers last February. The 30-second ad and an extended version will be posted on IMS social channels, the IMS YouTube channel and IMS.com/May shortly after it airs Sunday evening, so fans can watch and share on their social platforms. The New England Patriots and Los Angeles Rams will play in Super Bowl LIII in Atlanta. The game kicks off at 6:30 p.m. (ET) Sunday. 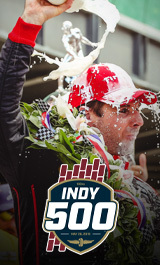 Tickets are on sale now for the 103rd Indianapolis 500 presented by Gainbridge, scheduled for Sunday, May 26 at IMS.